It’s always the season for sharing and this bountiful gift has enough to please the whole crowd! Three bottles of well-crafted California wine are matched with a gourmet selection including chocolate-covered sandwich cookies , cheddar cheese, crackers, toffee almonds, cookies, and Belgian chocolate. 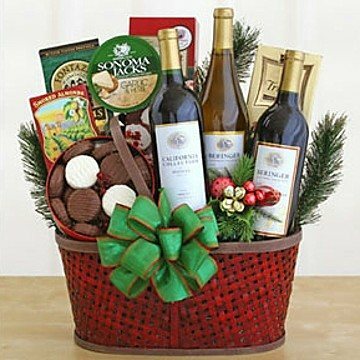 This gift includes the following: Three full bottles of California wines (brands vary), chocolate-covered sandwich cookies, cheddar cheese, crackers, toffee almonds, cookies, and Belgian chocolate. Florida and Idaho have a small number of dry counties. You will receive e-mail notification, if there is a problem shipping your wine order to one of these states. If any substitutions are necessary, they will be made with items of equal or greater value. Please note that this gift is only available for purchase and receipt by persons over 21 years of age.